Weighing balance tables enable balances to operate in vibration environments not previously possible, such as in manufacturing facilities with heavy equipment and on upper floors of buildings. 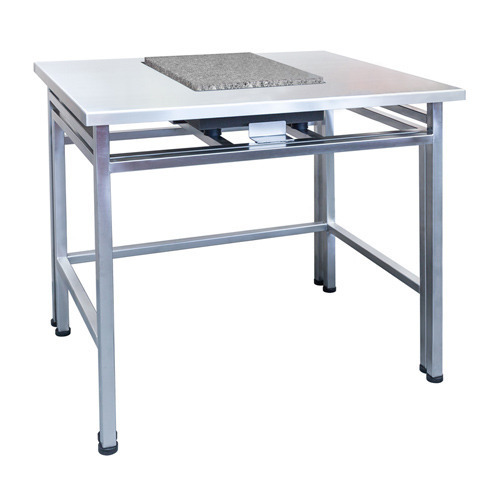 The weighing balance table is designed for laboratories or sample preparation rooms, to provide suitable working conditions for ulta micro balance, micro balance, and analytical balance. The table provides comfort for equipment operation and elimination of both, ground vibrations and vibrations being a result of user’s activity while operating equipment. The table design consist of stable SS 304 frame, equipped with adjustable leveling feet and heavy granite top for equipment. For WEI-SS-304 model both inner and outer table frames are made of SS 304 square tube, where as the top is made of polished granite. WEI-SS-304 weighing balance table for laboratory balances has been designed to satisfy the user with the greatest possible measurement stability. The table provides comfort for equipment operation and elimination of both, ground vibrations and vibrations being a result of user’s activity while operating balance. We also take up orders with customized dimensions matching the customer’s needs.